Chinese and Japanese female paramilitary auxiliaries receive the ashes (of fallen soldiers), (国防婦人会員と共に遺骨の出迎をする愛路婦女隊員), from North China Railway Archive. Image taken at Changxindian Station, Beijing–Guangzhou railway, December 1939 (image detail). Image license: CC BY 4.0. 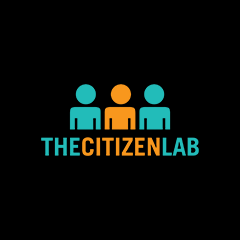 A new online database launched in February 2019 offers a glimpse of life under the wartime occupation of northeast China by Japan. The North China Railway Archive, which organizes the 39,775 photographs into a searchable catalogue, is a collaboration between several Japanese research institutes and the University of Kyoto, which came into possession of the photographs at the end of the Second World War. So far in 2019, the University of Kyoto has organized several exhibits featuring just a small number of photos in the collection. 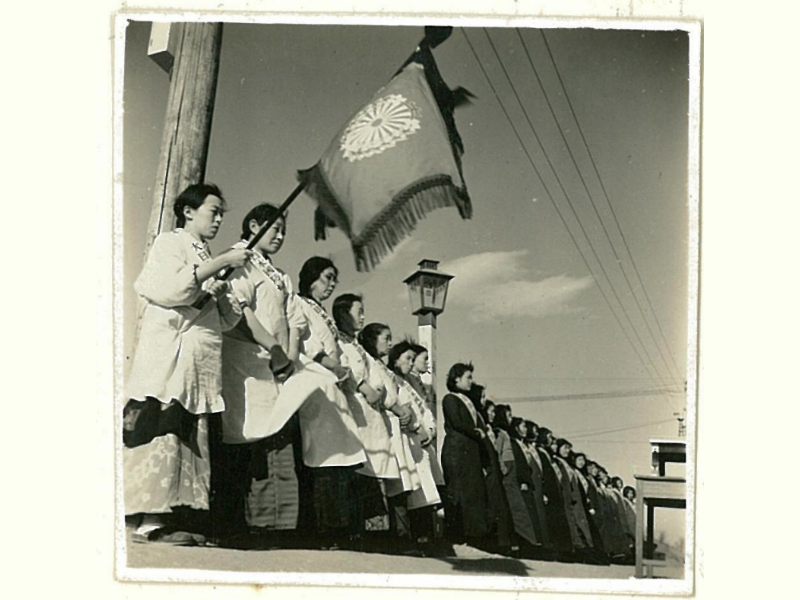 Both the nature of the photos, which were intended to showcase or whitewash Japan's occupation of northeastern China, and the general tone of the photo exhibits, have reportedly provoked strong reactions outside of Japan, in China. 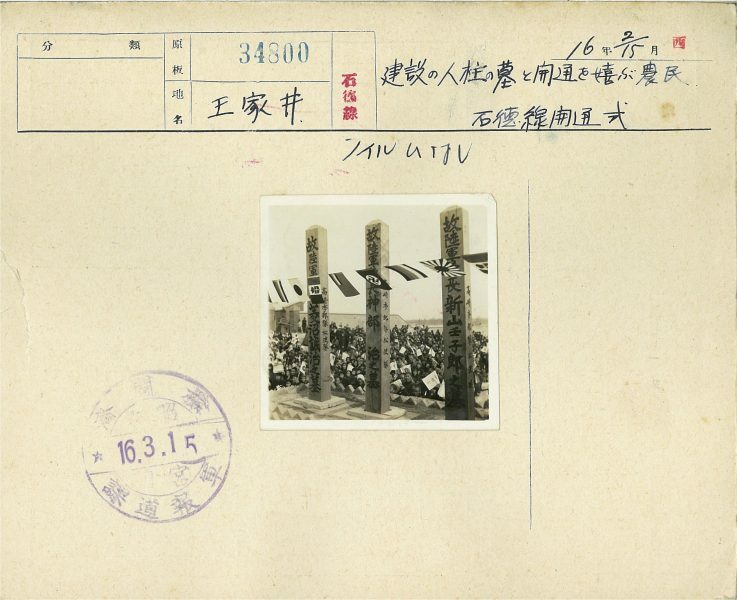 Image caption: “Peasants celebrate the opening of the Shidexian rail line and the dedication of monuments to fallen construction workers” (建設の人柱の墓と開通を喜ぶ農民), Wangjiajing, 1941. Image source: North China Railway Archive. Image license: CC BY 4.0. As a primary source, the image scans in the collection include the original matte blocking, as well as detailed documentation about the location of the image, when the image was taken, the name of the photographer and notes about what is being depicted. 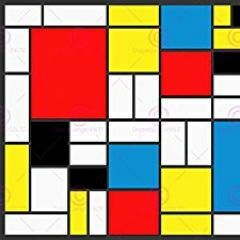 The images were originally intended to be promotional stock photographs, and were taken by North China Transportation Company (華北交通) employees. The company operated in the region controlled by the so-called Provisional Government of the Republic of China (中華民国臨時政府, in Japanese), a puppet state in northeastern China that was supported by and collaborated with Japanese occupation forces during the Sino-Japanese war. The company managed thousands of kilometers of bus and rail lines in northeastern China, connecting the Jingjinji region surrounding Beijing with Harbin and other cities in Manchuria, the location of another Japanese puppet state in northeastern China. 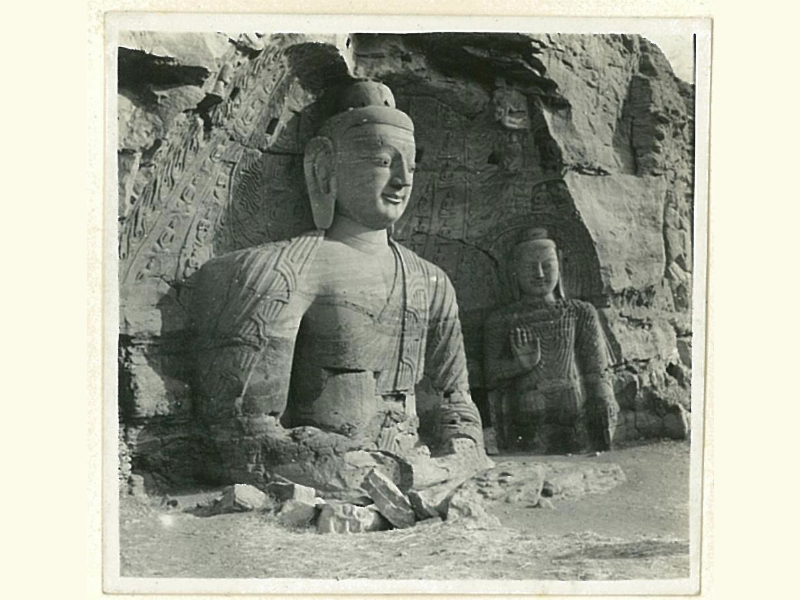 Image detail: Stone buddhas at Yungang Grottoes in Datong in 1939. Image source: North China Railway Archive. Image license: CC BY 4.0. Besides showing off Japanese infrastructure investments in the region and demonstrating the supposed orderliness and peacefulness of the Japanese occupation, the images also promoted tourist destinations throughout the rail network (map) operated by the North China Transportation Company. 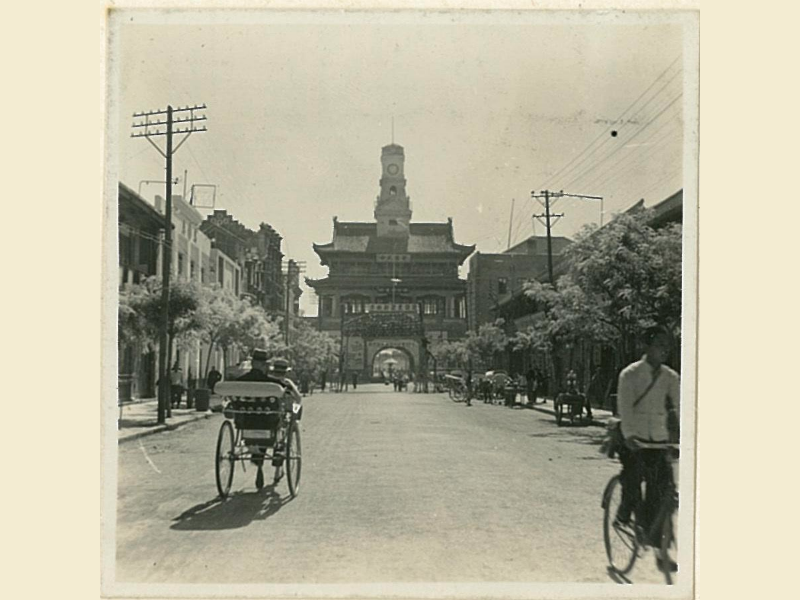 Image detail: Drum tower near Kaifeng Station on the Longhai railway in 1939. Image source: North China Railway Archive. Image license: CC BY 4.0. The sheer number of photographs in the collection means there are many scenes of city life in Beiping (now Beijing) and other parts of northeast China during the years of Japanese occupation in the 1930s and 1940s. Image caption: “The view from Hengshui Castle” (衡水城外を望む). Image taken near Hengshui in July, 1941 (image detail). Original image source: North China Railway Archive. Image license: CC BY 4.0. Since the photos were staged by photographers working to promote the North China Transportation company, there is no documentation of the extreme hardships suffered by Chinese people during the fighting and occupation of China during the Sino-Japanese War which lasted from 1937 to 1945. It's estimated up to 22 million Chinese civilians died during these years, while enduring brutality and atrocities at the hands of Japanese invaders, such as the Nanjing Massacre. The photographs taken by North China Transportation Company, launched in the midst of the Sino-Japanese War, were intended for public relations, and barely touch on battlefield conditions. Instead, the photos preserve the culture, folklore (of China at the time), as well as the development of regional transportation infrastructure, resource development and industrial development. While photos published in glossy magazines, newspapers and other places where censored by the military, unpublished photos (in the collection) did not undergone such censorship Therefore, if one pays close attention to this huge collection of stock photos, it is possible to glimpse the China nearly 80 years ago. Some photos portray landscapes now lost in China today. Exhibits put on by the University of Kyoto, called “the China of 80 years ago” (８０年前の中国) also present the photos as a resource to understand the past, and make no reference to Japan's wartime role. The focus of internet users differed greatly (between Japan and China). On Chinese social media, there is comment after comment that says “Don't forget our history and don't forget (China's) national disgrace.” Comments by Japanese internet users focused on the scenery along the railway and so on. The 39,775 images in the North China Railway Archive are organized by tag, by year, and according to the train station nearest to where the photograph was taken. 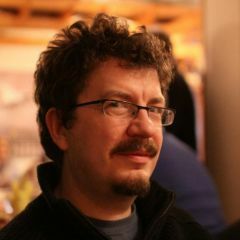 The license allows the images to be freely shared and adapted, as long as credit and attribution is provided to the North China Railway Archive.